Ireland fly-half Ronan O'Gara could claim the all-time International Championship scoring record against England this weekend. O'Gara (469) needs 11 more points to overtake the current record held by England's Jonny Wilkinson (479). All of O'Gara's points have been scored in the Six Nations while Wilkinson's haul includes sixty points he scored in five Five Nations appearances in 1998 and 1999. There have been 121 matches since 1875 in the second-oldest fixture on the international calendar. England lead by 70 wins to 43. The last of the eight drawn games was in 1968. Ireland won the only previous match between the sides at Croke Park (in 2007). England's highest score to date is 50-18 at Twickenham in 2000. Their 46-6 win in Dublin in 1997 is the biggest winning margin of the matches. Ireland's best result is 43-13 at Croke Park two years ago. England scored a record seven tries at a windy Lansdowne Road in their 36-14 victory in 1938. Their skipper that day, Peter Cranmer, was relieved of the captaincy for the rest of the season! Ireland's best try total is five: in 1905 at Cork, and in freezing conditions in Dublin in 1947, when they won 22-0. England's Paul Grayson set the record for most points in a match, scoring 23 at Twickenham in 1996. Ollie Campbell established the points record for Ireland by scoring 21 in Dublin in 1983 and Ronan O'Gara matched that achievement at Croke Park in 2007. The only try hat-tricks scored in the series were by Henry Taylor for England at Manchester in 1881 and Chris Oti at Twickenham in 1988. A dozen Irishmen have scored two tries in a match - Shane Horgan's brace at Twickenham in 2006 being the most recent instance. The overall record for scoring most tries in the fixture belongs to Rory Underwood, who scored seven for England between 1984 and 1996. Six Irishmen have scored three for Ireland. Jonny Wilkinson is the leading overall scorer in the fixture with 86 for England in eight games between 1998 (when he made his test debut as an eighteen-year-old) and 2008. 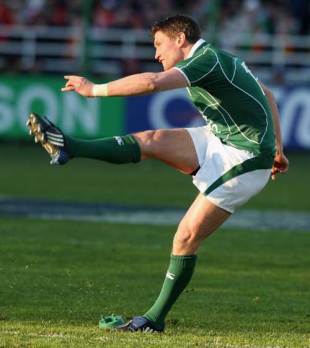 Ronan O'Gara holds the Irish record for the series with 78 points. Mike Gibson, who played in 15 successive matches for Ireland (1964-78), set the record for most appearances in the games. Rory Underwood appeared 14 times for England.